After more than 22 years, I finally saw my high school chum Patricia. The last time I saw her was during the architectural board exams in the 80s. When I mentioned this to her, she can't even remember that we did see each other on the 2nd day of the 3-day board exams! How could you not remember Pat? You were in a dilemma that day for the exam was plotting and you did not bring a protractor! 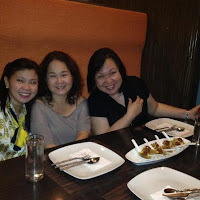 Anyway, Annie (another high school chum), Pat and I had a wonderful dinner at Greenbelt 5. The long-drawn dinner took us down memory lane. The 5-hour dinner just wasn't long enough.